ELKA STAGE 5 SHOCK DOUBLE A-ARM SUSPENSION: Double a-arms front and rear with Elka Stage 5 shocks makes this mid-sized machine the ultimate sport machine to tackle almost any terrain. 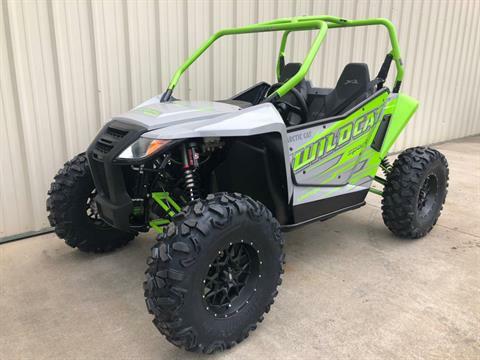 Giving you 12.2 inches of suspension travel up front and 12.6 inches in the rear. 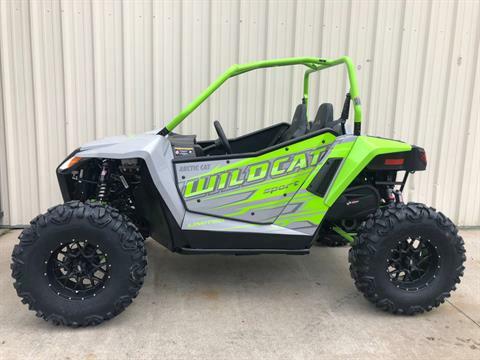 ELECTRONIC POWER STEERING (EPS): Arctic Cat's electronic power steering (EPS) activates automatically at the moment of ignition. Steering your machine requires minimal effort, even at slow speeds and rock crawling. 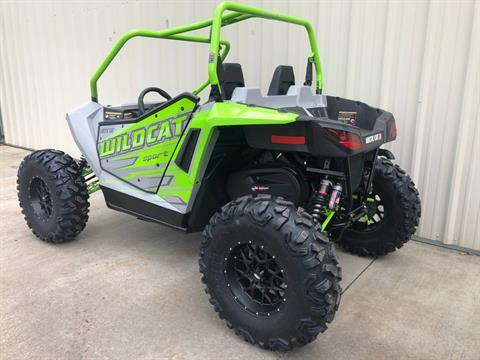 INFINITELY ADJUSTABLE TILT STEERING: The Wildcat's infinitely adjustable tilt steering allows you to position the steering wheel in that "just right" position for any rider. CARLISLE TRAIL PRO TIRES WITH COLOR-MATCHED ALUMINUM WHEELS: The Trail Pro 4-ply tire is designed exclusively for the Wildcat Trail and Sport. Light, strong and performance hungry. The custom color-matched aluminum wheels give this combo a solid one-two punch. REAR 2-INCH RECEIVER: Hooking up to your boat trailer, utility trailer, SPEEDPoint™ attachments or whatever you need to haul doesn't get much easier with this rugged, 2-inch rear receiver. PASSENGER HANDHOLDS: The driver shouldn't be the only one having fun. With proper handholds, the passenger is able to enjoy the ride in a position they prefer. FULL ALUMINUM DOORS: Increase you knee and elbow room with these lightweight aluminum doors. The aluminum tube frame and aluminum skins provide excellent coverage and style. Sealed edges help keep out dirt, sand and debris. RACE-INSPIRED HIGHBACK BUCKET SEATS: Aggressive feel, but comfortable. That's what these high-back bucket seats are all about.